TS Police Recruitment 2018: Telangana State Level Police Recruitment (TSLPRB) Board Announced recruitment notification to fill about 18428 SI, Constable posts. Check TSLPRB Notification/ Application Form, Eligibility, Apply Online Procedure, syllabus, exam pattern in Detail mentioned below. Telangana State Level Police Recruitment Board has hosted a job notification for 18428 constable and sub inspector vacancies. Candidates from Telangana region and wishing to become a police constable, SI can check the details and apply for the Constable and SI posts through online. The online application form will be shortly accessible on tslprb.in. The organization is soon going to release the official notification with all detailed information. In which, candidates can also check the details of starting date of application, last date to apply, eligibility criteria, selection process, application fee, application process, pay scale, important dates and other details from it. Candidates wishing to apply for TSLRPB Constable SI jobs can download the official notification PDF from the official website, tslprb.in. Candidates interested to know more details can check the following article. 1,88,715 Applicants who applied for the Posts of SCT SI Civil and / or equivalent will be administered the Preliminary Written Test on 26th August from 10 am to 1 pm. 13,944 Applicants who applied for the Post of SCT SI (IT & C) will take their PWT from 10 am to 1 pm on 2nd September and 7,700 Applicants for the Post of SCT ASI FPB – from 2.30 to 5.30 pm on the same day. 4,79,166 Applicants for the Posts of SCT PC Civil and / or equivalent will be having their Preliminary Written Test on 30th September 2018. Telangana State Level Police Recruitment Board is the government police department of Telangana state. The board works for the recruitment of suitable candidates into various police posts in the Telangana police department. The TSLRPB has hosted a job notification for a large number of posts this year. 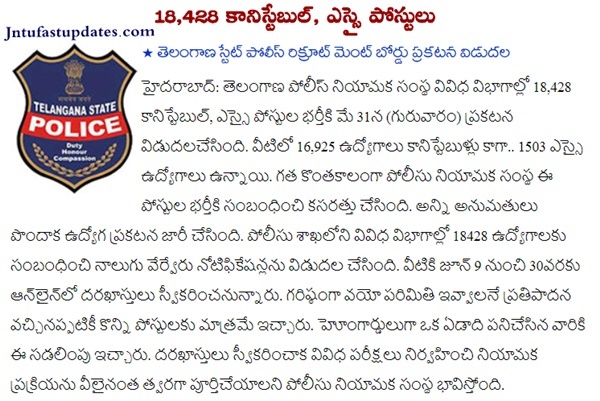 Recently, it has announced 18428 Constable and Sub-inspector posts. The board released the TSLRPB Constable notification PDF on its official website, tslprb.in. Candidates can stay checking the website to download the notification. Candidates wishing to apply for TSLRPB Constable and SI posts must have the minimum educational qualification of 12th Class + Graduate Degree from any recognized board/university. Age limit of the aspirants must be in between 18 to 25 years. Candidates belong to the reserved category will get age relaxation (as per norms) in their upper age limit. Candidates will be selected through various phases of selection process Prelims written test, PMT (Physical Measurement Test), PET (Physical Efficiency Test), and mains Written test. Selected candidates will get good pay scale from the Telangana state government. Interested aspirants can check more details from the following article. How to Apply For TS Police Constable & SI Jobs 2018 Online? Click on TS Police Recruitment 2018. The number of vacancies indicated above is only tentative and is liable to change without any notice. TSLPRB reserves the right to notify required modifications with regard to any aspect of recruitment during the process of recruitment. Note : People while applying any doubts in TS Police Recruitment Application Form Eligibility, Start/ End dates, Procedure to apply online filling application form etc can comment below. we will help you. Thank you. All the Best. 1.1 How to Apply For TS Police Constable & SI Jobs 2018 Online? Other state people are eligible or not? Some people are other state quota 15% or 05%.. I have to change my Exm language English to Telugu is possible now sir please tell me answer plzz…..
Can I apply more than one posts?